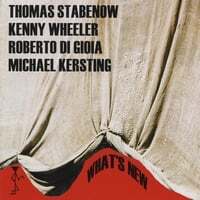 Here is a rare opportunity to hear Kenny Wheeler accompanied by an excellent rhythm section ( Roberto Di Gioa, p – Thomas Stabenow, b – Michael Kersting, dr) playing compositions from the "Great American Songbook". In the history of art and of course in the history of jazz, there have always been periods of time, phases and eras which have been labeled afterwards. Looking at it from a later date, that might make sense. Labeling the present is not all that easy, and one can debate whether it is at all necessary. Sometimes one could get the impression that, especially writers and critics, can't live without it, that they have to put a name on something, put something into a drawer. However, it just can't be done all the time, especially if musicians of different origins and influences get together to make music. This occured to a meeting of Thomas Stabenow, Roberto DiGioia, Michael Kersting and as a special guest, Kenny Wheeler. The group promises thrilling and intelligent music, that is associated with the question: "What's New?". Thomas Stabenow, winner of the jazz prize of the federal state of Baden-Württemberg, has always drawn attention to himself with his special and well outlined productions, whether it was for his group "Straight Four" or different productions in duo or trio. On the present CD the centre of attention is whithout doubt the Canadian-British trumpeter and flugelhorn player Kenny Wheeler. On the piano, meanwhile a surfer between styles as well, we hear Roberto DiGioia from Munich, Germany. To add a subtle rhyhtmic background, Thomas hired a friend from former musical times, the drummer Michael Kersting from Stuttgart. This musical summit was recorded at "Trixi" Soundstudio in Munich, Germany by Willi Schmidt, who again achieved an acoustic masterpiece. The "Trixi", a former movie theater from the fifties, is especially appreciated among jazz musicians because of its great acoustics. Thomas Stabenow, born in Kirchberg, Jagst in 1952, studied upright bass at the Musikhochschule Stuttgart. In 1986 he moved to Munich. For years he has been one of the most demanded German bass players in jazz. He plays in Peter Herbolzheimer's "Rhythm Combination and Brass" as well as with the likes of Toots Thielemans, Clifford Jordan, Joe Pass, Charlie Rouse and Lee Konitz. He is the editor of the "First German Real Book" and on his own label "Bassic Sound" has released quite a few interesting jazz productions, which wouldn't have had a chance to be released on a commercial label. All of them bear Thomas' taste and flair for high qualitiy, non-affected jazz. Kenny Wheeler, born in Toronto, Canada in 1930, moved to Great Britain in 1951, where he played with the Johnny Dankworth Orchestra from 1959 until 1964. As a freelancer he worked with Mike Gibbs, Friedrich Gulda and the famous Kenny Clarke-Francy Boland Big Band. From 1966 he was in regular contact with the international Avantgarde scene, Anthony Braxton or the "Globe Unity Orchestra" just to name a few. In 1974 his own album "Song For Someone" was named"album of the year" by the Melody Maker Magazine, and "Gnu High" with Keith Jarrett, one of the bibles of my generation, was named number one by the German jazz critics. Kenny Wheeler proves his variety and frankness in the band "Azymuth" with Norma Winstone and John Taylor and in the band of Dave Holland. Barely any other jazz musician has crossed the lines between "straight-ahead" and Avantgarde like Kenny Wheeler has. His sound is closely connected to his kind of melodic interpretation, and therefore his playing is absolutely unique, stilisticly incomparable, unquestionably recognizable. Roberto DiGioia was born in Pfaffenhofen a.d. Ilm, Germany in 1966, where he graduated high school in 1984. The same year he moved to Munich. Being influenced by pianists like Sonny Clarke and Wynton Kelly, he quickly made contact with the large Munich jazz scene. In 1985 he already played with Frank St.Peter and Ed Kröger and soon afterwards in the bands of Art Farmer, Aladar Pege, Klaus Weiss and the writer of these lines. Since then Roberto has worked his way to the top, less by iron will maybe, but by an impressive and apparently never ending development of his style; an evolution away from his idols, still never forgetting the roots. His latest engagements with Jim Snidero, Buster Williams, Gary Peacock and David Holland are prove of this. Michael Kersting, born in Rottenburg, Neckar in 1954, has made his home in Stuttgart. His playing has been influenced by many styles, which gives him a great variety. He has played with musicians like Chet Baker, Benny Golson, Jaco Pastorius, Jack Bruce, Steve Lacy and Ernie Watts. He also won the jazz prize of the federal state of Baden-Württemberg and recorded his own CD for "Bassic Sound" (with Wolfgang Engstfeld, Claus Stötter, Roberto DiGioia and Thomas Stabenow). That means, that this outstanding rhythm section played together already before this production. Gentle and tender, played as a medium Bossa-Nova, the CD begins with how the CD and the idea is called: "What's New"; written by bass player Bob Haggart. Originally the tune was written for trumpet player Billy Butterfield in 1939, and so is one of the early jazz tunes in history. With a big hymn-like flugelhorn sound and rythmically complex lines Kenny Wheeler makes his statement. Over and over one is impressed by his unorthodox phrasing of the triplets and the sixteenth notes. (Swiss trumpet player Mathieu Michel must have listened a lot to him!) Expressive solos by Roberto DiGioia (he quotes "If I Should Loose You"!) and Thomas Stabenow follow, and, after a brief drums interaction, they bring us back into the theme. A tasty vamp carries us home, as gentle as it started. "Et Altera Pas" (an old Roman judiciary statement meaning "One might as well listen to the other side") is the first original composition of this production, written by Thomas Stabenow. The tune was composed for the awarding of the "Jazz prize of the federal state of Baden-Württemberg" in 1986 and is a quiet waltz with a special harmonic concept. Peter Herbolzheimer, particularely fond of this tune, wrote a big band arrangement on it, that was first performed at a EBU production (European Broadcasting Union) in St.Gerold/ Austria. The event was also the goodbye ceremony for retiring ORF jazz producer Paul Polansky. In 1990 Peter Herbolzheimer recorded the tune on his CD "Friends and Silhouettes". The rubato theme is introduced by Roberto DiGioia, playing dark and sensitive (what a piano sound! ), before the rhythm section joins "in-time" in the "bridge". If you think you are hearing a rhyhtmic change, you're mistaken, for it's only that the rhythm sustains on beat three of the fourth bar. Kenny interprets the theme and takes the first solo. The band plays the "bridge" rhythmically so complex that it reminds the listener of a musical trapeze act, but they all come down alive and well. Through the interestingly built harmonies and the individual form of the tune the band plays in the best manner of "call-and-response". A (new) classic! Next comes Wayne Shorter's ballad "Penelope". The tune, again a waltz, is taken from his album "Et Cetera" (with Herbie Hancock, Cecil McBee and Joe Chambers). First Roberto Di Gioia leads us quietly and hesitantly through the theme, which Kenny takes over on muted trumpet. In spite of the calm mood, Kenny is expressive and he has something to tell! Roberto's solo is more reserved and concealed with wonderful voicings and sounds. "Penelope" ends with a very brief melody fragment. Those who have enough of waltzes should forget the next tune; but who would do a thing like that, right? Because all three tunes are so pleasently different. We arrive at Kenny Wheeler's tune "Spring's Eternal". Four bars of 4/4 time in the "bridge" bring us to the upcoming end of the waltzes! With a modal and pathetic flair the rhythm section introduces the introduction. Kenny establishes the thorough theme while the chords are going up chromatically, which one might hear only by listening to the bass! Next is the "bridge"with those four bars in 4/4 and four bars in 3/4 which leads us right into the third section. That is a modified "A" part, just a minor third up. Roberto DiGioia's solo is inspired and ends with McCoy-like chords and lines. Thomas Stabenow takes over the melody for a second, just to hand it over to Kenny. A well outlined, impressive tune! After this set of three deep and gentle compositions, which seem like a visit at an exhibition of a expressionist painter, there is a sudden change! Kenny's introduction is still quiet and humble, and one might ask whether one has heard this melody before. After eight bars in rubato comes the definitive solution, because Roberto enters and plays very clearly the melody of "How Deep Is The Ocean". Mostly known by Frank Sinatra's interpretations, one wonders whether this Irving Berlin song from the early thirties is liked by others than Swing fans. And again, we end up asking the same questions as in the beginning, and we are anxiously looking forward to Mister Wheeler! Before he comes in, we hear an extremely masterly, fiery solo by Thomas, and Roberto pushes the rhythm section ahead. As expected, Kenny develops the tune in his own personal way with harmonically risky lines and screaming outbursts on the flugelhorn. Truly a high class meeting! Since we're doing old standards, we might as well do another one, Thomas might have thought and called up one of the all time standards "Yesterdays", written by Jerome Kern in 1933. Big and fat, the rhythm section comes along in the introduction. Roberto presents the first theme, and after a keychange (half step up! ), Kenny takes the melody. This harmonic concept continues in the solos and gives the tune a new, exciting character. All members of the band have plenty of time for extensive solos. Next we are listening to Billy Strayhorn's rarely played ballad "A Flower Is A Lovesome Thing". No need to mention that all Billy Strayhorn compositions have an incomparable depth. It simply calls for poetry and in our case for the harmonic sensitivity of Roberto DiGioia and Thomas Stabenow. However, at the end of his solo, Roberto can't stop to quote Thelonious Monk's "In Walked Bud"! That's jazz! For me, "A Flower Is A Lovesome Thing" is definitely the culmination of this wonderful and tasteful CD. With a bouncer the listeners are sent off from this CD fading right into Roberto DiGioia's piano solo. Harmonically and melodically modified, he presents us "What Is This Thing Called Love" by Cole Porter.With massive bass notes and block chords he plays around the theme, which leaves us in the flugelhorn solo. What's New? Any Questions?! Thomas Stabenow's "What's New" differs pleasently from other productions, where international well-known guest solists are invited. Very often this happens for business reasons, or because someone wants to distinguish himself. This is definitely not the case on this present CD, and one can feel it, too. There is a musical conception for this formation and that's what effects the listener. In addition there is a well picked selection of tunes. Truly a pleasure for friends of "real jazz", lovers of interesting harmonies and subtle notes in between; of rhythmic variety and lyrical thoughts; of expressive expression and of deep thoughtfulness. Just jazz!